With charismatic lemurs, cat-like fossas, and prickly tenrecs, Madagascar has no shortage of endemic species. 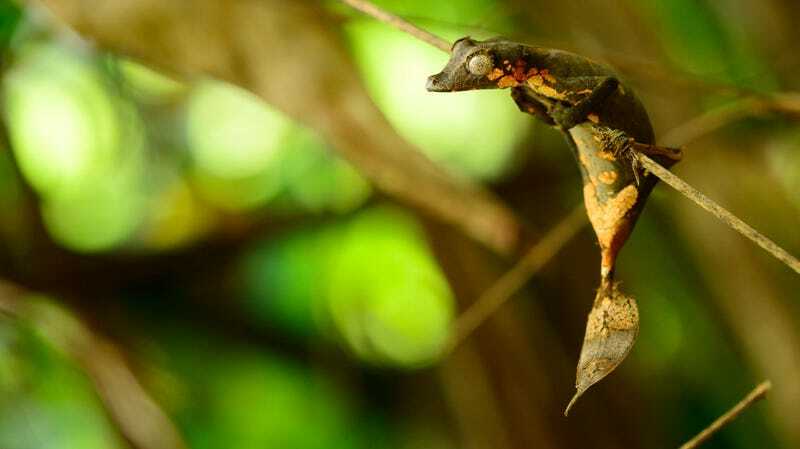 Leaf-tailed geckos, genus Uroplatus, are similarly a Madagascan original. Well over a dozen species have evolved on the island, and all are equipped with impressive camouflage. In the ultimate RPG of Life, these reptiles have maxed out their stealth skill trees, appearing indistinguishable from an old leaf when at rest. Their tails are flattened and leaf-shaped, and their skin has blotchy colors and textures, even incorporating ragged edges on skin folds for that authentic, “brittle decay” look. At about four inches long, the new geckos are 50 percent larger than their satanic cousins, and have a proportionally shorter tail. The new geckos also have purely scarlet red tissue in their mouths, potentially a last-minute warning to predators; in their close relatives, the mouth is more black. When the team analyzed the geckos’ genetics, their results aligned with the physical conclusions that the Marojejy lizards warranted classification as a new species, Uroplatus finaritra. Scherz says that “satanic” geckos described as ‘giant’ or ‘large’ morphs have already been exported to the U.S and Europe, and that these animals are likely actually Uroplatus finaritra. This blindspot in the Convention on International Trade in Endangered Species of Wild Fauna and Flora (CITES) quota system for exporting exotic animals is also open to intentional abuse.